The accolade of Norfolk's local hero recently went to a man of incredible courage and leadership who made his name at sea. On this occasion however, Lord Admiral Nelson didn't quite cut the (Colman's?) mustard. In the BBC poll, Norfolk's local hero was named as a humble crab boat fisherman from Cromer called Henry Blogg. Born in 1876, Blogg joined the lifeboat crew at the age of 18 and during an incredible seafaring career lasting 53 years, he saved 873 lives. In the days before motorised boats, the crew of the cromer lifeboat (whose average age was over 50!) would be summonded to duty by a maroon, and regularly put their own lives in peril, relying on old fashioned manpower and courage to get the job done. I've spent time in Cromer in all weathers and in the icy wind and rain it can feel like an epic task just popping out to Budgens for a loaf of bread - let alone taking to the roaring seas in a wooden rowing boat. 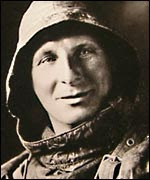 Due to his heroics as Coxwain of the Cromer lifeboat, Henry Blogg has become surely the world's most famous lifeboatman. The famously humble Norfolk man won the George Cross, a British Empire medal and many other awards for bravery. On top of the cliffs, a bronze bust of Blogg gazes intently out across the vast North Sea panorama which he conquered on many occasions - in spite of the fact that he never learnt to swim! RoadTour – the UK’s first audio-visual tour guide for Sat Nav - has sent me on a mission to uncover Britain’s hidden treasures. Last year I spent several months compiling RoadTour’s heritage guide which provides fascinating information on the UK’s top 600 heritage locations – and I jumped at the chance to become treasure hunter again on a tour of Britain. So, with my RoadTour GPS guides at the ready (which also include indispensible information on 900 fantastic pubs and inns and 3000 restaurants), I will be exploring as many of these as possible and hopefully unearthing lots more interesting treasure troves. I am reporting back regularly via the hidden treasures blog, so watch this space!